Slightly acidic cleaner for deep-down cleaning on different surfaces. DETERFUG is a slightly acidic cleaner for different surfaces and is especially formulated and developed to clean deep down and remove stubborn dirt from surfaces. 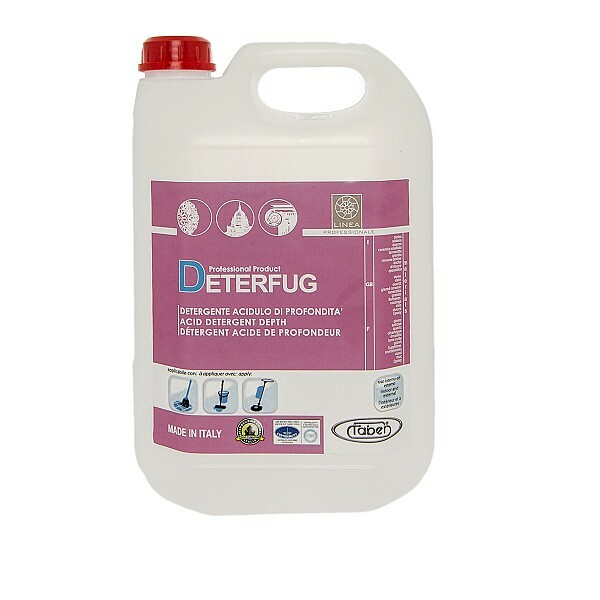 Its specific formula means that DETERFUG has a deep cleaning action, even acting within the pores and rough surfaces of materials for fast, complete removal of built-up dirt, without damaging the surface. DETERFUG can be left to work for several hours with no risk of ruining or attacking treated floor coverings. DETERFUG is active against different types of dirt, including oily or inorganic, and this means it is also ideal for extraordinary surface cleaning operations. When used regularly, it can dissolve and remove dirt that has built up and which daily cleaners cannot shift. Its deep action is also able to remove the dirt that is trapped in a material’s pores or rough-textured surface, leaving the floor completely clean and free from any dirt. The action of DETERFUG also completely renews grout, removing the build up of dirt and restoring its original appearance. DETERFUG is also very effective when it comes to removing the surface film that can be found on many floors due to insufficiently thorough worksite cleaning or when epoxy or cement-based fillers have been used, or even due to insufficient maintenance or deposits from other detergents. DETERFUG can be successfully used on unpolished limestone surfaces, combining the efficient scale removing action of an acid-based product with the gentle action of its special formula.